This is the fifth case study in a series on territorial tax systems in other countries. The intent of the study is to see what lessons the U.S. can learn from other countries’ experiences and to evaluate the validity of some of the fears critics express when discussing what would result if the U.S. were to move to a territorial system. The unemployment rate in the Netherlands has trended downward since the early 1980s. 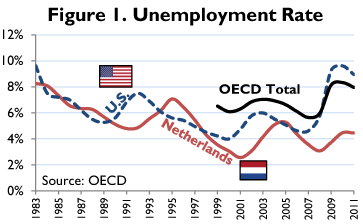 Particularly since 1998, Dutch employment figures have consistently scored better marks than the U.S., and in 2011, unemployment in the Netherlands was half of the U.S. figure (Figure 1, above). This occurred while the Dutch pursued a policy of foreign engagement and outbound investment. This is not to suggest that the territorial tax system is the primary driver of positive labor market outcomes in the Netherlands, but the territorial system has clearly not prevented these outcomes. Perhaps just as shocking is the Dutch system’s tax revenue performance. It has consistently out-yielded the U.S. system, as well as the OECD average, until very recently (Figure 2). 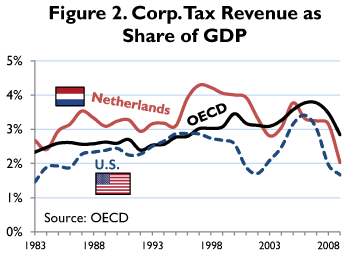 In only one of the last thirty years did the U.S. worldwide system collect more tax revenue as a share of GDP than its Dutch counterpart. And like Canada, this has occurred in the context of ever-decreasing tax rates; the top marginal rate has been lowered five times since 2001, moving from 35 percent to 25 percent. In sum, the Netherlands has operated a competitive territorial system with substantially lower corporate tax rates than in the U.S. and it has experienced better labor outcomes and greater levels of corporate tax revenue. The Dutch case specifically rebuts each of the fears associated with territorial taxation and may be held up as an international tax exemplar. See Paul Vlaanderen, Why Exempt Foreign Business Profits?, 25 Tax Notes International 1095, 1099 (Mar. 11, 2002). See Vlaanderen, supra note 1, at 1095. See Joint Committee on Taxation, Background and Selected Issues Related to the U.S. International Tax System and Systems that Exempt Foreign Business Income (May 20, 2011), at 31, http://www.jct.gov/publications.html?func=startdown&id=2793 [hereinafter JCT, Background]. See Schoon Statement, supra note 2, at 5. See Vlaanderen, supra note 1, at 1097. See Vlaanderen, supra note 1, at 1096. See JCT, Background, supra note 4, at 32.